Alisa specializes in Sports Massage , Swedish Massage and Remedial Massage. Really happy to have a home massage, such a great service! Thank you again!! A. I decided to become a massage therapist when I was a disability support worker and there was a massage therapist on board massaging our clients and I saw what a wonderful difference she would make to the guys. It has an immediate calming effect and to people that suffer anxiety and challenging behavioural issues, it did wonders. So my career change began there. 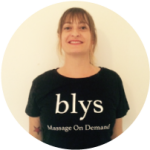 A. I love Blys for the reasons being it’s a platform for therapists to do what they love doing without having to do the things they don’t like doing such as marketing and advertising. It’s a two way street. As it’s only starting up I’m excited for the opportunity to meet new customers and work as a team. Plus the guys that brought it to fruition are pretty awesome. A. Yes I have definitely found massage therapy to work and have instant immediate effect. It’s proven to relax the nervous system whilst eliminate toxins from your body through the lymphatic system. It relieves joint pain and muscular pain and tension. It’s highly recommended for anyone really in this modern day that either sits at a desk at their computer or just never gets time for themselves. Not to mention pregnancy and sports and massage is a given. A. Haha I guess you can tell mostly that you have given a great massage when the client gets off the bed and they can hardly speak. I think if you send the client away from this reality for a while and bring them back gently then your job is done. You get a lot of people falling asleep on your bed and that’s always a good sign too as sometimes you tap into what their body needs so much and it relaxes them so deeply that they go into a very deep and meditative place. Apart from that I’ve never had a bad compliment and my customers always say it was great. A. My favourite spot in Sydney, that’s a tough one because there are so many wonderful places in Sydney. I’m usually drawn to the beach or the bush so if I have to pinpoint a place, I would say Bundeena in south Sydney. I lived there in my early 20’s and it’s a magical spot where lots of artists and musicians and healers would be drawn to. I love the South Coast too. I haven’t spent too much time on the North Shore but I’m sure they have some magic spots as well.